One of the goals of every writer should be to have those that read his work regard him brilliant. Another goal, and a far more difficult and impressive one, is to have the reader think brilliant thoughts while reading that work. 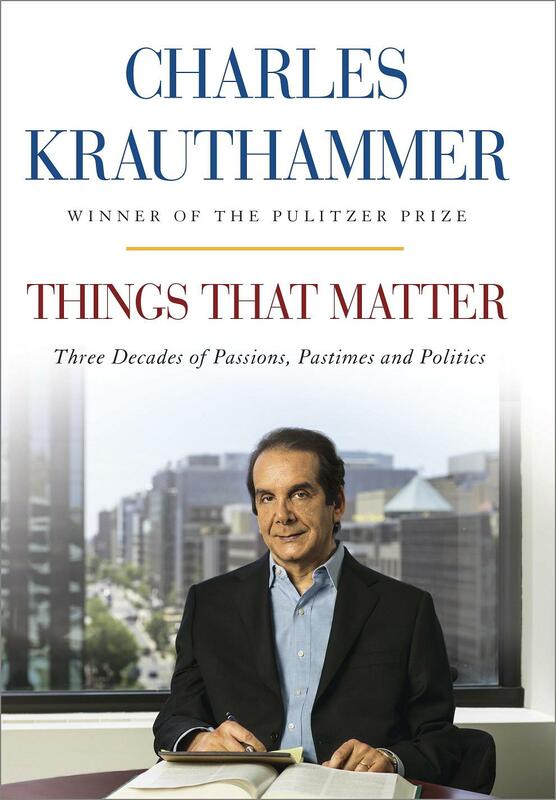 Whether or not Charles Krauthammer’s new book Things That Matter: Three Decades of Passions, Pastimes and Politics accomplishes the former is relative to the reader, but in my humble opinion, the books definitely accomplishes the latter. In the second chapter, following the requisite intro, and the requisite chapter describing the author’s days of youth –playing baseball– Charles Krauthammer posits the notion that Time Magazine got it wrong when they nominated Albert Einstein “Man of the Century”. Einstein may have been vital, argues Krauthammer, and he is “certainly the best mind of the century”, but Britain’s Prime Minister Winston Churchill “carried that absolutely required criterion: indispensability” in the 20th century, and to the 20th century. One thought this reader had, while reading, is that provocative, bar stool discussion would have it that no person had a more prominent effect on the 20th century than Adolf Hitler. While that is arguably true, a question to that provocative notion should be, were the lessons of Hitler’s evil transgressions more transcendent than Winston Churchill’s efforts to, as Krauthammer later describes it, “slay that dragon”? Hitler was, of course, indispensable to any study of the 20th century, in that he illustrated much of what’s wrong with human nature, and he gave us a template for how we should treat countries after war (after World War I). Though evil can take many forms, Hitler provided students of history a model of unprecedented evil that we can now use as a guide to detect evil, based on the precedent he set. We will hopefully no longer allow an evil despot to rise to such levels of prominence in their country that they would be in a position to coerce its citizens to do such evil things to one another. With all these lessons and precedents regarding absolute evil, students of the 20th century say that Hitler has to be the man of that century. It’s a provocative notion, and it would probably give Hitler the stature, and historical value, that he sought all along. How many men, and how many precedents of the 20th century, will be cited more often than those Hitler provided humanity for centuries to come? Young people, involved in bar stool discussions, love such provocative notions, for they provide all listeners the impression that the provocateur is intelligent with such shock and awe proclamations. Most of us love such impressions, when we’re younger. As we age, and move past the desire to be perceived as intelligent, we actually become more intelligent, and we realize that most provocative thoughts should go through careful examination and attempts to disprove. The final conclusions we reach may not be as provocative, or as memorable, but as we age, and read, we realize that being right is more valuable than being memorable or provocative. There is no doubt that the lessons evil men leave behind are monumental in history, but too often these provocative conversations leave out the dragon slayers that should, at least, be considered as prominent, if not more so. To say that Winston Churchill hasn’t already achieved a prominent place in history would be foolish, as most historians continue to rank him in their top five most prominent figures of the 20th century, and most left-leaning historians will rank him in their top twenty. Does he deserve even greater prominence than we’ve already allowed, however? One of the reasons Churchill is not higher on the list, I would submit, is that hindsight has proven that he was so obviously correct in his doomsayer predictions about Hitler. The idea that all of his warnings were so obviously on the mark, however, makes it almost boring to declare him the most prominent person of the 20th century. It’s an of-course statement that causes readers to yawn over the headline, when a more prominent listing of others, such as Einstein, prove far more provocative, compelling, and newsworthy. Churchill was, as Krauthammer writes, “A 19th century man parachuted into the 20th,” but “it took a 19th century man –traditional in habit, rational in thought, conservative in temper– to save the 20th century from itself.” Yawn. Such lines don’t play well on the cover of a magazine to suggest that Churchill was right about Hitler, and thus he should be nominated the Man of the Century for speaking out and saving us. Especially when compared to the exciting, and revolutionary, bullet points a writer can compile with points about Einstein’s accomplishments. Before dismissing the obviousness of Churchill’s warnings, one has to examine what he was up against while still in the British Parliament. Most of the British Parliament, and Prime Minister Neville Chamberlain, dismissed Churchill’s warnings. They did not want to view Hitler through Churchill’s simplistic, black and white lens. Churchill’s warnings were viewed as the impulsive, irrational, and the unreasonable views of a war hawk. Neville Chamberlain has been viewed, by right and left historians as one of the obvious fools of the 20th century, but is it a glaring headline that Churchill should be viewed as the most obvious hero of the 20th century, no, because it is just so obvious. It doesn’t require any creativity to back up. It just is what it is, as we now say. Churchill suggested that the year’s delay between the Munich Pact and what he deemed an inevitable war worsened Britain’s position, in direct opposition to Chamberlain’s assessment. (Editor’s note: Chamberlain would later declare that that year allowed the British to bolster their troops, and that the British military was not prepared for war during the previous year.) In that year, between Munich and World War II, Chamberlain also exhausted the possibility of diplomacy with détente, blockades, and anything and everything the world could use to achieve “peace in our time”. To refute the Chamberlain claims, Churchill stated Hitler could have been removed from power by a grand coalition of European states to prevent World War II from happening in the year in question. That suggestion, that in some cases waiting too long can worsen one’s position, would rear its ugly head before Hitler’s body even went cold, when U.S. General George S. Patton’s warned General Eisenhower about Russia. Eisenhower, presumably recognizing that Patton’s warnings were not unfounded, responded that Americans were simply too war-weary to make any moves against Russia. The suggestion would later haunt the world in the 21st century, with Iraq in 2003, in a manner some would suggest the reverse of the Churchill suggestion, saying that we acted too impulsively, and the suggestion will probably haunt nations around the world for many more, because the human instinct is to avoid war at all costs, no matter how black and white, and simplistic, and obvious the need for action becomes. It may appear redundant to call an historian a hindsight historian, since history is documented in hindsight. Some historians document the facts of the era while others provide hindsight commentary to historical events that were not as clear to the historical figures of the day, but these historians provide the unlimited omniscience that hindsight provides. Hindsight historians may document Churchill’s warnings as obvious now, but most hindsight historians will not tell you how popular Neville Chamberlains “peace in our time” efforts were at the time. Another question those that believe Hitler’s quest for power was so obvious that it’s now redundant to talk about, should ask themselves how obvious it was to Neville Chamberlain at the time. How obvious was it to the British Parliament, the isolationists in America, and the world at large. Much like today, Churchill was regarded as a war hawk, and presumably a fear monger when he spoke of what he believed to be Hitler’s aspirations. Some have said that Churchill is almost solely responsible for the meetings that occurred at Tehran, Yalta, and Potsdam with FDR and Stalin that eventually won the war for the allied forces. We’ve all read hindsight historians document that America shouldn’t have been “so stupid” as to allow the attack on Pearl Harbor, when so many signs pointed to its eventuality. It’s easy for them to look at the decade preceding the terrorist attack on September 11, 2001, to declare that we were obviously naïve in trying terrorists as criminals rather than wartime adversaries. It’s also easy for them to write that that the call to war in Iraq, in 2003, was impulsive based on our inability to find weapons of mass destruction in Iraq. What’s not so easy, however, is for those figures that were involved in the present tense of history to stick their neck out and speak out against the conventional wisdom of their day and declare that it’s “weak and blind” to continue to follow the conventional line of thinking. Hindsight historians now slightly diminish Churchill’s role in 20th century, because it is now so obvious that Hitler was the epitome of evil. To read through an objective telling of the history, however, it obviously wasn’t so obvious to some at the time. Krauthammer, Charles. Things That Matter: Three Decades of Passions, Pastimes and Politics. New York, New York: Random House, 2013. Print.